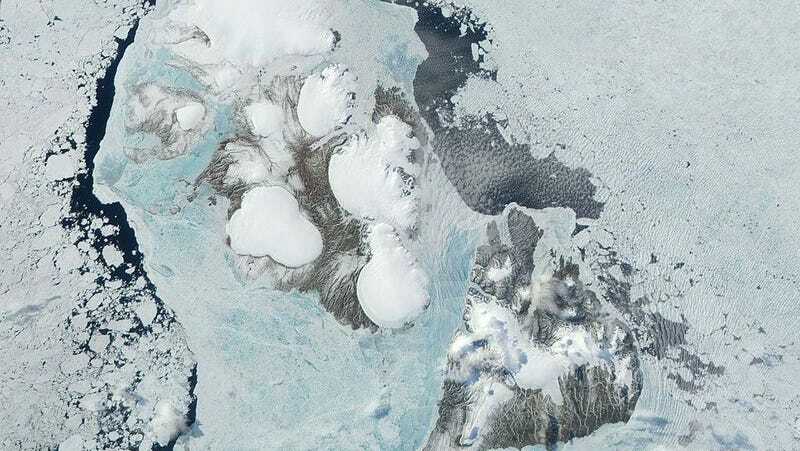 October Revolution Island, site of the Vavilov Ice Cap, lies at the center of this 2001 NASA satellite image. That’s because the Vavilov Ice Cap—located on October Revolution Island between the Kara and Laptev seas—is situated in a polar desert, a region whose frigid temperatures and dry weather should keep ice firmly tethered to the underlying bedrock. Instead, some of Vavilov’s ice is now surging toward the ocean, accelerating from mere inches of motion per day in the 1990s to as much as 82 feet per day in 2015. The findings raise the troubling possibility that other cold, polar desert ice caps—ice sheets in miniature that are found mainly at high elevations—may be prone to sudden and rapid destabilization as the Earth warms. “It is startling that the Vavilov Ice Cap, until recently an apparently stable ice cap with an almost entirely frozen bed that is almost entirely above sea level, is able to rapidly discharge such a large proportion of its ice in to the ocean in such a short period,” the scientists write in a new paper in Earth and Planetary Science Letters. The research team, led by University of Colorado Boulder geologist Mike Willis, used satellites operated by DigitalGlobe to track the speed and thickness of the ice cap over time. Around 2010 they noticed an acceleration of ice in an outlet glacier around the cap’s western margin, followed by a much more rapid surge in 2015. While that region of ice advanced just 1,300 feet (400 meters) between 1952 and 1985 per the paper, the ice front spilled more than 3 miles (5 kilometers) into the ocean between 2015 and 2016. The acceleration is pictured in the satellite image time lapse above. The authors suspect the sudden surge was a result of the bottom of the ice becoming wetter, possibly due to surface meltwater percolating through cracks, and the progression of the glacier’s front onto slippery sediments. While the ice slowed its progression somewhat in 2017, the researchers say it is “unlikely” the cap will recover what mass it has lost given our warming climate. Stef Lhermitte, a satellite and remote sensing expert at the Delft University of Technology who studies glaciers and ice sheets around the world, called what was happening to the Vavilov Ice Cap “remarkable” in an email to Earther. Ice caps like Vavilov cover about 170,000 square miles of our planet’s surface and hold back a potential foot of additional sea level rise, according to the study. As the satellites that track Earth’s icy regions improve, it might be worth taking a closer look at these regions to see if they’re really as stable as we thought. It wouldn’t be the first time we’ve questioned that assumption of late.